Learn how to carve a beautifully personal spoon in this invigorating 1-day workshop with London Green Wood! Time to get hands-on with nature! This unique experience will leave you hungry for more woodworking ventures and might uncover a hidden talent! Working outdoors in our woodland workshop, with just three tools and log of locally grown native wood, we'll make a wooden spoon. 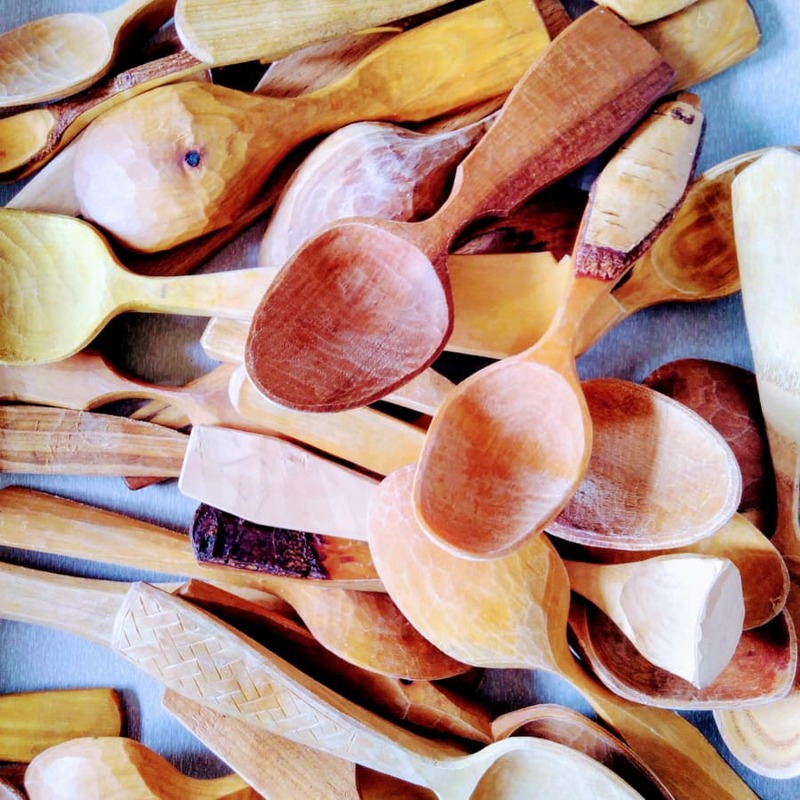 Using an axe and knives, you will make your own cooking spoon from a locally grown tree. This course covers axe skills and safe knife grips. Aimed at complete beginners and those who’ve made the odd spoon but would like to develop their skills and designs. If you get the woodcarving bug you can follow this course up with our Bowl Carving course. Or if you want to begin with something simpler, start with our Make a Spatula course. Wood can be used for all manors of things. Mostly, and certainly in that case of London Green Wood, beautiful wood is used to create an array of stunning objects. However, did you know that wet wood, unlike dry wood, could also conduct electricity? That's what we call versatile! 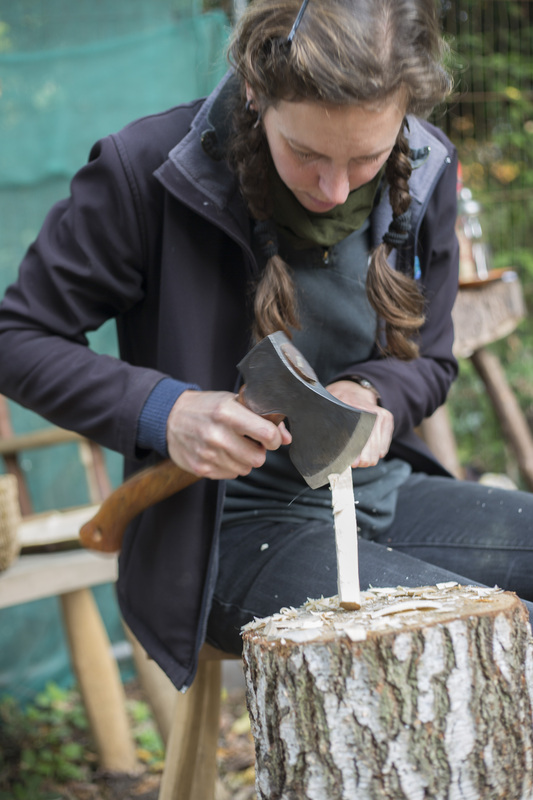 Fantastic day with Jo, a fantastic teacher who talked us through the basics of green wood, knife safety, tool handling & after some practice, on to make a wooden cooking spoon out of a wedge of newly axed Sycamore greenwood. Left feeling very inspired, happy & ready for more. Just give it a go!! I had a great time learning to spoon carve yesterday! The gorgeous setting of Abney Park was the perfect backdrop to our class, and Jo's expert and friendly tuition kept us safe and enabled us to all come away with a usable spoon by the end of the day. It was all over too soon! A really enjoyable day with gentle attentive tutors, tucked away in a quiet little park in London. It really is a lovely thing to take a log of fresh green wood and chop, carve and whitlle it away into something you can use every day. A very friendly supportive and safe atmosphere is cultivated and I think everyone left very happy with their day's work. I'd imagine sales of axes, woodcarving knives and various guide books are boosted every time the course is run. Recommended. A really lovely day in a peaceful setting. Jo was patient and kind as well as being very instructive and helpful in ensuring we all got support and advice. The course was excellent. Jo is a great teacher. She takes you through: how to use the tools safely and effectively, what tool to use - and when and how, and she makes it all great fun. Working outdoors with pots of tea on the go just makes it even better. Highly recommended. We really enjoyed our spoon carving course with Jo. There were a total of 6 in the group which worked very well so we had sufficient guidance and attention.Jo was a calm, clear, cheerful teacher. The day was well planned and timed, for each part of the spoon process. Definitely recommend. A great one day spoon carving course. The tutor was excellent, with lots of skills and techniques that she taught in a straightforward, easy to understand manner. After seven hours I had very sore hands but a wooden spoon that I was very proud of! Spoon Carving workshop was great and had a lovely atmosphere. Would definitely recommend to friends and family. I'd highly recommend this workshop - fun, fulfilling, relaxing and delivered wonderfully by the patient, talented Jo. I really enjoyed the Spoon Carving Workshop. It took place outside which in itself was a treat and the teaching was great. Jo was enthusiastic and very professional in the way she lead the class. I wouldn't hesitate in recommending the day to a friend. Thank you. Lovely warm and welcoming atmosphere. Super friendly. Very knowledgeable teachers. Great venue, nice to be outdoors, all the tools you could need. Nice shared lunch. Really enjoyed my day, even with the cold and rain it was so worth it. Teacher Jo was great she gave you great encouragement and taught great skills. She had an assistant Dave who was very helpful and supportive as well. On booking I really did not think I would achieve a spoon by the end of the session, but I did and I am very proud of it. We had a great day and the teaching was good. We had Jo as our main instructor and Julian and Dave assisted. They were skilled and experienced themselves and communicated well and with appropriate authority. The tools were good quality and everything was prepared beforehand for the session. The weather in early March was bearable outside, but I don't think sufficient warning that it was a day outside was given before booking. I think a venue with indoor space, even in a workshop or shed, is needed for winter courses. Thank goodness the weather had improved over the previous week! The afternoon went rather too quickly and we all enjoyed ourselves. Thank you. It was great fun! Good vibes, good strong milky tea, good teaching, and good company. Would highly recommend it and for sure do it again! This was a first class course which I would recommend to anyone. I had one of the best days ever at the spoon carving workshop. It was a really lovely day so it was nice to work outside. I was quite intimidated by the idea of woodwork but Jo made us really comfortable and had a lot of patience with me when I couldn't get the hang of the techniques. There was tea flowing all day which was great. I would love to come back and make another spoon to improve on what I've learned. Jo was such a fantastic teacher, clear, friendly, expert and patient. Using local wood was lovely and the setting is beautiful. Couldn't ask for more. Really fun day of woodwork. Jo is great at making sure the course is informative but also fun. Came away with a great spoon and inspiration to do more! Such an excellent workshop, I can't recommend it enough. 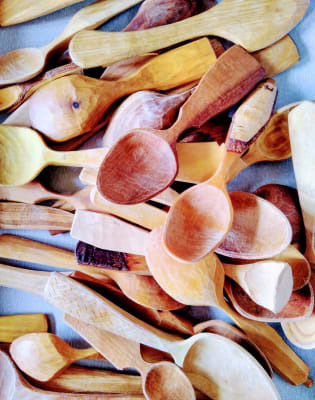 You'll come away with a beautiful cooking spoon to feel proud of – and you'll be amazed at how quickly you transform a wedge of wood into a work of art. Jo is a really lovely and helpful instructor, very encouraging and helps you get the best from the course. Really recommend it. Fantastic class! The tuition was brilliant and the setting was beautiful. I cannot recommend the spoon carving workshop with London Green Wood CIC highly enough! The one-day workshop was perfectly paced and allowed for learning and variation with the various tools and techniques. Jo was a brilliant teacher and leader of the workshop, offering friendly guidance, advice and helpful tips along the way. The location itself is really well set up for the group session and, as it is a working community workshop we were able to meet some local experts, and see some of their wonderful creations. I am very keen to sign up for their bowl carving workshop and have been inspired to get my own tools to continue spoon carving at home! I learnt to use special tools to turn a segment of a log into a fully useable kitchen spoon - with a corner to clean out the bottom of a pan! A perfect introduction to greenwood carving with left and right-handed tools to suit. Jo ensured we had a tool-talk for each new knife we used, and learnt safe and effective techniques to keep us safe whist carving our masterpieces. A really lovely day spent with a small group of nice people, all carving wood. The campfire kept us warm, Jo kept us safe and we all came away with new skills and beautiful wooden spoons. Highly recommended. Really fun day with lots of insights into the best techniques of how to whittle the perfect spoon. Thank you! London Green Wood is a non-profit community of woodworkers practising rural crafts in the city. Based at Abney Park Cemetery, a small woodland in Hackney, we work with green wood straight from the log and hand tools. All the wood we use has been felled locally. We have been running events and teaching courses at our woodland workshop since 2011. We promise a beautiful setting, friendly people, the satisfaction of learning new skills and a fire when it gets chilly. We run courses for adults, for groups and for families. We also run a twice weekly 'Wood Club' community workshop and monthly volunteering days to build equipment at the workshop. We have no indoor space and will be working outside in all weathers (under a tarp if it rains) so please come prepared. No sandals or bare feet please. Walking boots or work boots if you can, a thick sole will help to keep your feet warm in cold weather. In winter, fingerless gloves can be good, but no full gloves when working with tools. If you use reading glasses please bring them with you, you will need these when we practice tool sharpening. Tea and coffee are provided, snacks to share with the group are always welcome.